I agree totally and also feel powerless to do anything useful. (I don't think this one can be pinned entirely on Trump, though, since I have not heard many critical remarks from Republicans.) Recycling is great, but hardly makes a difference. I think electing Congress persons is probably the most effective approach, so if you live in a district that is at all in play that is where I would put my efforts. "Re-cycling" was meant to be irony; I agree it makes no real difference, at least on the scale of our two-person house. Fortunately, my Congress person is John Yarmouth, a very liberal and effective Democrat. (That he is the only Democrat in the KY delegation says a lot about my state.). Your second state is politically crucial and has many pressing issues. I understand the proposed budget slashes funding for environmental work on the Great Lakes. Are there local groups you can connect with on these issues? Since your most useful skills are likely research, writing, and editing, you might be able to contribute remotely in the off-season if you make connections in the next few months. Re-cycling may not have a huge impact on the environment, but every time we do it, it is a moment we are thinking about the health of our planet. Maybe that is the biggest impact of it. As far as our ridiculous withdrawal of the Paris Accord I hope more mayors will just continue on as planned. My city, Columbia, MO is a refuge of common sense in a state that can drive me crazy. Calling Roy Blunt is an exercise in futility - I've tried. I'm a new member of ACLU. Keep trying to stay sane in insane times. 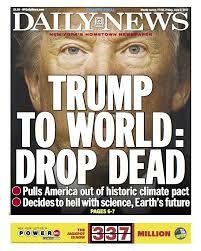 My lowest day since the election was the day that trump pulled out of the Paris Accord. It meant not just a failure of our obligation to our planet, but it put our beloved country at odds with the rest of the world. Recycling is one gesture but as a couple we also try to work hard at reducing and re-using. It makes us feel virtuous if nothing else although if everyone were to do the same, it would have an impact on packaging, marketing and consumerism generally. The good word needs spreading. I have tried to work my volunteering around flexibility so that I can travel without feeling that I am letting anybody down. Good causes generally need advocates and lobbyists to campaign on their behalf. I've found that a lot of this can be done online and in theory from anywhere with an internet connection. Your representatives at all levels work for you once they've been voted in and mine must now get sick of hearing from me, but at least I don't waste paper or forests on the effort now we have e-mail.